Jane Austen's Pride and Prejudice has a very timeless feel to it. Some of the issues regarding class may feel a bit dated in today's world, but otherwise, the story has universal themes that anybody can relate to. This is why there are new adaptations every few years, from the Bollywood inspired Bride and Prejudice, to the romantic comedy Bridget Jones's Diary. Although the basic story works well when transplanted to today, it takes an adaptation like this one to show how good the material really is. Director Joe Wright and adapter Deborah Moggach keep the setting in 18th Century England and remain true to Austen's novel and ideas. They know what works, and use a fantastic cast to bring the story to life. By keeping things in Georgian England, Wright is able to keep the focus on the differences in class that restrict simple things like falling in love. The Bennets have five unmarried daughters and are not that well off. The only way for them to ensure future financial stability is to find rich husbands. So when the dashing and very rich Mr. Bingley (Simon Woods) moves nearby, Mrs. Bennet (Brenda Blethyn, Pooh's Heffalump Movie, Beyond the Sea) does everything she can to set him up with her eldest daughter Jane (Rosamund Pike, Doom, Die Another Day). Jane is fine with this, because she and Bingley do share a mutual attraction. Bingley's friend Mr. Darcy (Matthew MacFadyen, The Reckoning, Enigma) thinks otherwise. He and Elizabeth Bennet (Keira Knightley, Domino, The Jacket), the second eldest Bennet daughter, meet and instantly loathe each other. 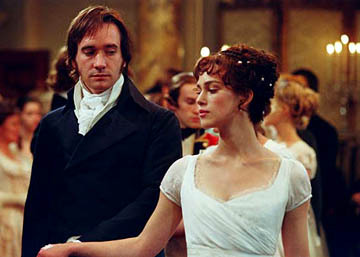 Elizabeth finds him arrogant and dismissive, while Darcy finds her too willing to voice her opinion. Darcy frowns upon his friend's interest in Jane only because the Bennets seem so destitute. When Mr. Collins (Tom Hollander, Stage Beauty, Possession), a dull socially inept relative, comes calling for a husband, Mrs. Bennet tries to push Elizabeth towards him, but she wants nothing to do with him. The story is pretty familiar to most everybody from this point on. Elizabeth and Darcy continue to meet and their dislike for each other grows. It's the type of dislike that everybody knows will eventually blossom into something completely different. Other characters arrive, and relationships form and break, but this is all beside the point. A familiar story is okay, as long as the people telling it do it ably like Wright does. Pride and Prejudice looks spectacular. The Bennet residence is small and humble, nothing like the luxury of the Bingley or Darcy manors. Moggach's script is sharp and mixes in a lot of wit and humor. And above all, the casting works very well. This is Knightley's best role to date. It is also the first which requires her to really act with something substantial. She has a very classic face, but a very modern sensibility, and this combination is perfect here (as opposed to Pirates of the Caribbean, where it felt very out of place) as Elizabeth. MacFadyen complements her well as Darcy. The best Darcys (Colin Firth being the best Darcy) look extremely uncomfortable in any social situation while radiating an aura of superiority. At the same time, this needs to shift to something gentler as they story begins to play out. MacFadyen is able to come off as a complete jerk in the beginning, and his slow transition to leading man seems very natural and unforced. Judi Dench (Ladies in Lavender, The Chronicles of Riddick) shows up for a wonderfully nasty but brief appearance as Lady Catherine de Bourg. But the best characters in Pride & Prejudice are the Bennet parents, played by Blethyn and Donald Sutherland (Lord of War, Cold Mountain). Blethyn is wonderfully obvious and annoying in her efforts to marry off her daughters, while Sutherland contrasts nicely with an understated performance. The movie pushes two hours, but oddly enough, feels rushed. It is a lot of fun to sit through, and unfortunately, feels like it ends far too quickly. 2 hours, 7 minutes, Rated PG for some mild thematic elements.